Objectives: The goal of our study was to determine the safety and durability of an endolumenal plication of the stomach. Methods and Procedures: Ten 25-kg female swine underwent standard upper endoscopy, during which a single, 12 mm intragastric laparoscopic trocar was placed. Using the EndoStitch device (U.S. Surgical), an 8cm gastric sleeve was created by plicating the stomach around the gastroscope. The gastrostomy was subsequently closed with 2-0 polyester suture under standard, laparoscopic technique. Animals were allowed to eat on postoperative day one and were monitored for level of activity, abdominal distention, bowel function, and wound appearance. Results: The swine were euthanized at 2, 4 and 6 weeks from the date of operation. A necropsy was performed and examination of the abdominal cavity revealed no signs of abscess. The stomachs were dissected and the plication was seen to be grossly intact in all specimens. Microscopically there was evidence of scar formation at the suture line. 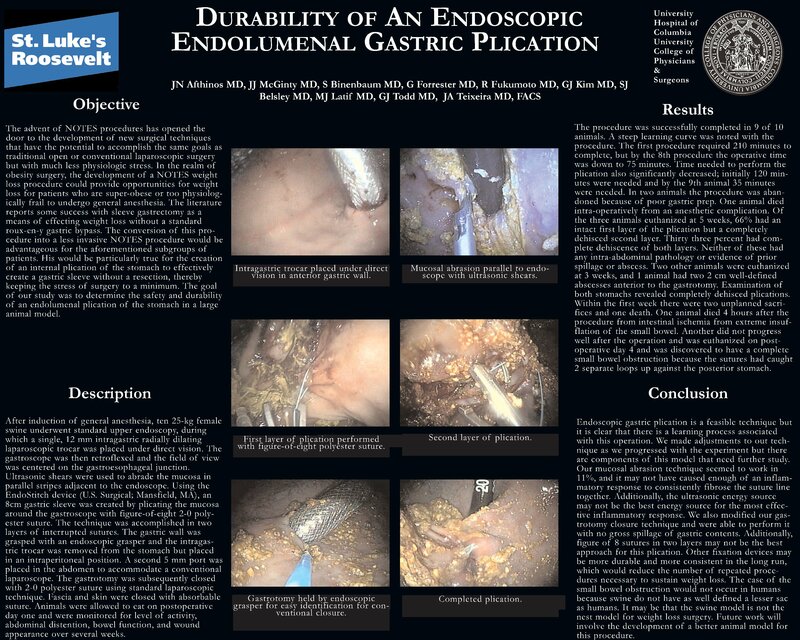 Conclusion: Endoscopic endolumenal gastric plication is a durable procedure for weight loss lasting at least 6 weeks in a large animal model.